An Air Quality Monitor for your Environmental Protection? From carbon monoxide to formaldehyde or particulate matters, air pollutants are extremely hazardous. Monitoring air quality via a professional indoor air quality monitor is an essential step towards better health and environmental outcomes. Why Choose An Air Quality Sensor? Provide quick information via wireless, continuous, and inexpensive monitoring. Air quality systems rely on diverse data shared on the cloud, therefore smart automation use case can be set up with other devices, such as the ventilation system. software programs, numerous accessories, and sometimes with a mobile app with a user-friendly interface. Therefore smart automation use case can be set up with other devices, such as the ventilation system. Air quality monitoring can lead to action steps and improve the health performance of private buildings as well as public spaces. Detecting dangerous concentrations and emissions can lead to a mind shift to better environmental protection. Outdoor pollution is a fact: industrial emission, auto exhaust, soot, and so on and on. Indoor air quality (IAQ), on the other hand, is also a major health concern. Whether it’s new furniture or smoke, indoor pollutants can be hazardous. Since natural ventilation is one of the main ways to reduce dangerous concentrations of VOCs and other gases, outdoor pollution often closely correlates with IAQ. It’s not a secret that in case the air outside is polluted, it’s better to close the window and trust the HVAC system of the building! To help people gain control over outdoor and indoor air quality, air quality monitors are essential. Note that radon has been linked to severe health problems, such as lung cancer; while nitrogen oxides (e.g. N02) leads to the formation of environmental abnormalities, such as acid rain. In addition, indoor air quality sensors can measure other relevant aspects which may affect IAQ, such as humidity, temperature. Although individuals cannot escape from global environmental problems, such as vehicle emissions, they can easily monitor and regulate the IAQ of their houses. What’s more, people spend 90% indoors, which makes the use of an indoor air quality sensor essential. However, with the increasing advancements of technology, people may wonder what sensor to choose. A sensor that gives a high-resolution picture but it’s hard to understand or an inexpensive home monitor like Foobot and Awair? In fact, according to marketing data, Foobot and Awair are the two most popular home monitors available on the market. 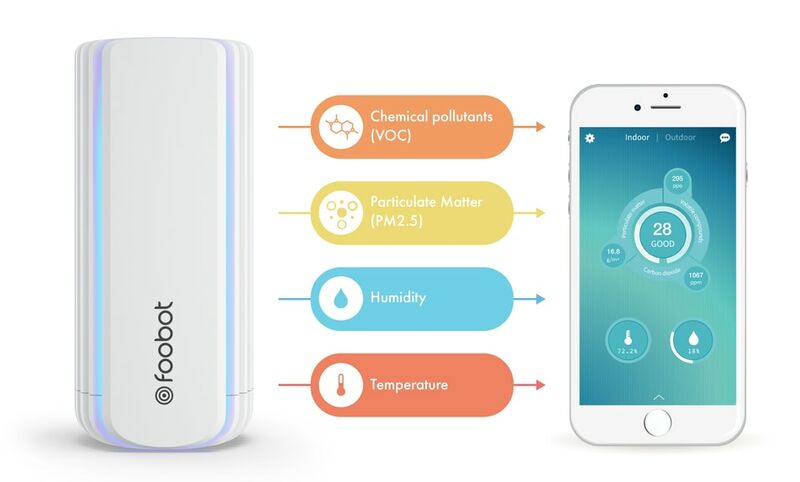 Regarding the accuracy of Foobot and Awair, the National Berkeley Laboratory conducted a study on seven indoor air quality monitors (including Awair). Berkeley researchers concluded that for fine particles (PM2.5), one of the most hazardous pollutant, Foobot has the most consistent and reliable measurement, when Awair has a less linear measurement compared to their reference laboratory equipment (meaning that sometimes Awair readings are good, sometimes Awair readings are out of the game). The key aspect is a sensor which measures what actually matters. Criteria pollutants, such as particulate pollution, and VOCs, such as formaldehyde, do matter. Understanding their origins and adverse effects is the first step towards better IAQ. Therefore, a good indoor air quality sensor must have accurate and calibrated sensors across all monitoring locations. What’s more, testing devices need a good web app to help people make sense out of data. Web Apps are not only accessories but necessities to visualize data. Taking about visualization, when it comes to Foobot and Awair, users reveal that Foobot offers a more user-friendly mobile app than Awair. Last but not least, any good sensor should drive users to take actions. Note that some effective action steps to reduce air pollution include the use of reliable ventilation systems and filters, plants that purify the air, and low-VOC building and cleaning products. To sum up, air quality monitors are not just home accessories that collect dust. Monitoring air pollution and IAQ (e.g. criteria pollutants and VOCs) can boost health outcomes. Good air quality monitors need accurate sensors to detect dangerous compounds (e.g. nitrogen dioxide or radon). Nevertheless, any good sensor goes hand in hand with a good monitoring app to support understanding and visualization. The environmental impact of pollution (e.g. exposure to particle matter) can be lethal. Therefore, as mentioned above, air quality monitors are not only accessories but factors for clean air and healthy lifestyle.